Today in U.S. Naval History - June 5 1794 - First officers of the U.S. Navy under the Constitution are appointed. The first six captains appointed to superintend the construction of new ships were John Barry, Samuel Nicholson, Silas Talbot, Joshua Barney, Richard Dale and Thomas Truxtun 1917 - First military unit sent to France, First Naval Aeronautical Detachment, reaches France on board USS Jupiter 1945 - Typhoon off Okinawa damages many U.S. Navy ships For more information about naval history, visit the Naval History and Heritage Command website at history.navy.mil. Today in U.S. Naval history – June 5 1794 - First officers of the U.S. Navy under the Constitution are appointed. The first 6 captains appointed to superintend the construction of new ships were John Barry, Samuel Nicholson, Silas Talbot, Joshua Barney, Richard Dale, and Thomas Truxtun 1917 - First military unit sent to France, First Naval Aeronautical Detachment, reaches France on board USS Jupiter 1945 - Typhoon off Okinawa damages many U.S. Navy ships For more information about naval history, visit the Naval Historical Center website at www.history.navy.mil. From the Navy News Service: 1794 - First officers of the U.S. Navy under the Constitution are appointed. The first six captains appointed to superintend the construction of new ships were John Barry, Samuel Nicholson, Silas Talbot, Joshua Barney, Richard Dale, and Thomas Truxtun. 1917 - First military unit sent to France, First Naval Aeronautical Detachment, reaches France aboard USS Jupiter (AC 3). 1945 - Typhoon off Okinawa damages many U.S. Navy ships. For more information about naval history, visit the Naval Historical Center Web site at www.history.navy.mil/wars/dates.htm. From the Navy News Service: 1799 - USS Constellation, commanded by Capt. Thomas Truxtun, captures the French warship l'Insurgente. 1943 - The organized Japanese resistance on Guadalcanal ends. 1947 - Carrier USS Wright (CVL 49) is commissioned. 1978 - A new era in naval communications begins with the launching of the first satellite of the Navy's Fleet Satellite Communications System. 1984 - Destroyer USS Moosbrugger (DD 980) fires approximately 150 shells at Syrian artillery positions east of Beirut. For more information about naval history, visit the Naval Historical Center Web site at www.history.navy.mil. The Navy's newest Arleigh Burke-class guided-missile destroyer, USS Truxtun (DDG 103), was commissioned Saturday, April 25, during a ceremony at Naval Weapons Station Charleston, S.C. The process of commissioning a Navy ship takes many years of trials and training and to finally reach this milestone is very important said Cmdr. Timothy Weber, commanding officer, USS Truxton. Designated DDG 103, the destroyer honors Commodore Thomas Truxtun (1755-1822) who embarked upon a seafaring career at age 12. When the U.S.
Truxtun successfully completed acceptance trials Oct. 3, and the ship got underway Sept. 30 from NGSB Pascagoula for a multi-day trial in the . All major systems and equipment, including the ship’s Aegis combat system, were tested by the Navy’s Board of Inspection and Survey. 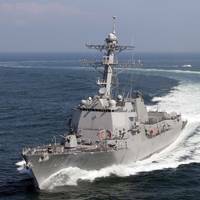 Truxtun is the 53rd Arleigh Burke class guided-missile destroyer. The ship will conduct a variety of operations, from peacetime presence and crisis management to sea control and power projection. The ship’s combat system centers around the Aegis combat system and the SPY-lD(V), multi-function phased array radar. The new destroyer honors Commodore Thomas Truxtun (1755-1822) who was selected as one of the Navy’s first six captains on 98. 1794 - First officers of the U.S. Navy under the Constitution are appointed. The first six captains appointed to superintend the construction of new ships were John Barry, Samuel Nicholson, Silas Talbot, Joshua Barney, Richard Dale, and Thomas Truxtun. 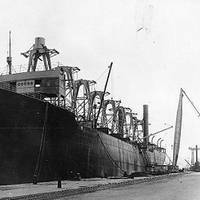 1917 - First military unit sent to France, First Naval Aeronautical Detachment, reaches aboard USS Jupiter (AC 3). 1945 - Typhoon off damages many U.S. Navy ships. From the Navy News Service 1797 - Capt. Thomas Truxtun issues the first known American signal book using numerary system. 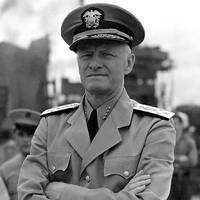 1942 - Adm. Chester Nimitz is named commander-in-chief, Pacific Ocean Areas, a joint command, and retained his other title, commander-in-chief, U.S. Pacific Fleet. 1992 - The first five coed recruit companies from Naval Training Center Orlando, Fla., graduate. From the Navy News Service 1799 - USS Constellation, commanded by Capt. Thomas Truxtun, captures the French warship l'Insurgente. 1943 - The organized Japanese resistance on Guadalcanal ends. 1947 - Carrier USS Wright (CVL 49) is commissioned. 1978 - A new era in naval communications begins with the launching of the first satellite of the Navy's Fleet Satellite Communications System. 1984 - Destroyer USS Moosbrugger (DD 980) fires approximately 150 shells at Syrian artillery positions east of Beirut. 1794 - First officers of the U.S. Navy under the Constitution are appointed. The first six captains appointed to superintend the construction of new ships were John Barry, Samuel Nicholson, Silas Talbot, Joshua Barney, Richard Dale, and Thomas Truxtun. 1917 - First military unit sent to France, First Naval Aeronautical Detachment, reaches France aboard USS Jupiter (AC 3). 1945 - Typhoon off Okinawa damages many U.S. Navy ships. For more information about naval history, visit the Naval Historical Center Web site at www.history.navy.mil/wars/dates.htm. In a traditional ceremony on Saturday, the U.S. Navy's 53rd Aegis guided missile destroyer, Truxtun (DDG 103), built by Northrop Grumman Corporation, was christened before more than 1,000 guests. one of the first captains in the U.S. USS Constellation. bottles across the bow, formally naming DDG 103 Truxtun. name. coast of St. Pollux in 1942. dozens survived thanks to the small mining town of St. Newfoundland, Canada. The entire town helped to rescue the sailors. The current mayor of St. Ed Lewis and Lanier Phillips. military strategy. subsurface battles simultaneously. the 21st century. Cdr. Timothy R. will lead a crew of 276 officers and sailors. 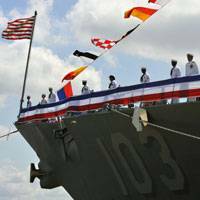 the 25th Arleigh Burke-class destroyer built by Northrop Grumman. navigational draft of 33 feet. ship to speeds in excess of 30 knots. From the Navy News Service 1800 - USS Constellation, commanded by Capt. Thomas Truxtun, captures French vessel la Vengeance. 1862 - USS Hartford, commanded by Capt. David G. Farragut, departs Hampton Roads for Mississippi River campaign. 1894 - Sloop Kearsarge, commanded by Cmdr. Oscar F. Heyerman, wrecks without loss of life on Roncador Reef off Central America. 1991 - Coalition naval operations continue in the Gulf War with an attack on the Al Kalia naval facility. One Iraqi Exocet-capable patrol craft is hit directly with two laser-guided bombs, while a second U.S. aircraft launches a string of twelve 500-pound bombs across another patrol boat. The bombs also strike several buildings on the pier, generating several secondary explosions.